Enter Make, Model, Year and Color Code (if applicable). Up until now, if you wanted a Parabellum Scout Fairing, you had to be a BMW owner. Now you can have one for your 2001-on Triumph Bonneville. The classic rounded Scout styling complements the classic new Bonneville styling and gives smooth aerodynamic touring protection and better gas mileage in a sport bike sized package that only weighs 4 1/2 pounds. 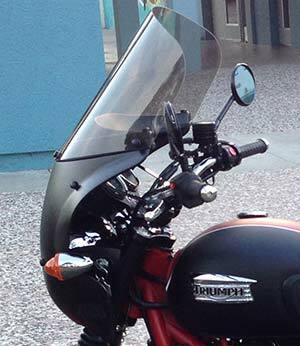 The stainless and aluminum mounts allow the fairing to be removed with 4 screws, but you will want to leave it on. 10in. 14in. 16in. 18in. 20in. Additional shields are $139 in clear and $149 in tint. Note: Scout Production is limited and lead times may vary from 2-5 weeks. Painted Scout Fairings are custom orders and are not returnable. The fairing arrived on Friday. I installed it yesterday and took it for a spin in extremely windy conditions. It's absolutely brilliant! Fit like a glove right out of the box and a great improvement on the bike! So many thanks to you and the team. Excellent job! 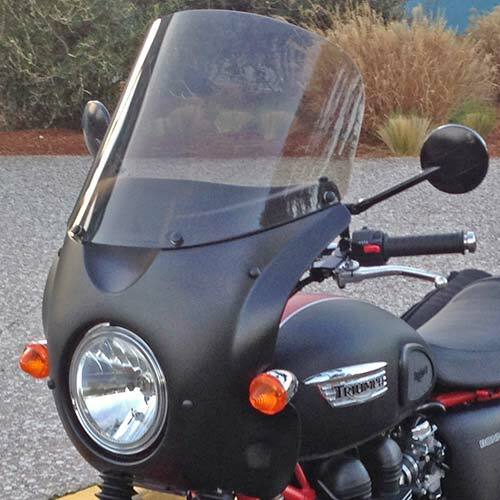 I ordered the Scout Fairing for my Bonneville. The wait was a little long, but worth it. The fairing and windshield by far exceeded my expectations. The ride is smooth, no more fighting the wind at high speeds, and the fairing added to the good looks of the bike. Now, with the fairing, and steering damper on my bike, I can ride out in the desert at 90 mph in comfort. The fairing really added to the performance of my bike. My fuel comsumption is better too. Thanks for a well-made product.